Elaine M. Myers, 84, of 110 Fredonia Rd., Greenville, (Hempfield Twp.) PA, formerly of 9 Penn Ave. Apt. 511, passed away at 5:11 am on Tuesday, January 29, 2019 at The Grove at Greenville. She was born in Portage, PA on December 30, 1934 to the late, Michael and Goldie (Burkett) Markovitch. 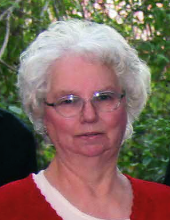 Elaine was a member of the Lifeway Church of the Nazarene in Greenville. She was employed for 28 years in the housekeeping department at Sharon Regional Hospital. Elaine held an interest in Amish culture and liked visiting Amish friends. She enjoyed crafting, social gatherings, reading, church activities, and traveling. Elaine is survived by: one son, Roy Myers, and his wife, Debra, of Phoenix, AZ; five grandchildren, Dannielle (Myers) Fowler of Surprise, AZ, Rhett F. Myers of Phoenix, AZ, Rory N. Myers of Carthage, NY, Ryan N. Myers of Jamestown, PA, and Riley J. Myers of Pittsburgh, PA; 12 great grandchildren; three sisters, Violet Poloisky, and her husband, Henry, of Cresson, PA, Jean Eichenbaut of Portage, PA, and Esther Dean of Hadley, PA. In addition to her parents, she was preceded in death by her husband, Roy F. Myers, two sisters, Dorothy "Jitterbug" Lewis and Joan Markovitch, and great grandson, Brody Fowler. Memorial contributions can be made to: Leukemia & Lymphoma Society, 333 E. Carson St. Suite 441, Pittsburgh, PA, 15219 . Messages of sympathy, stories, and photos can be shared at: www.osborne-williams.com. Arrangements are under the direction of: OSBORNE-WILLIAMS FUNERAL HOME AND CREMATION SERVICES, INC., 73-75 Columbia Ave. Greenville, PA 16125. No formal services are scheduled. To send flowers or a remembrance gift to the family of Elaine M. Myers, please visit our Tribute Store. "Email Address" would like to share the life celebration of Elaine M. Myers. Click on the "link" to go to share a favorite memory or leave a condolence message for the family.